It satisfies every childlike curiosity, every muted desire, whatever there is in him of the scientist, the poet, the primitive seer, the watcher of fire and shooting stars, whatever obsessions eat at the night side of his mind, whatever sweet and dreamy yearning he has ever felt for nameless places faraway, whatever earth-sense he possesses, the neural pulse of some wilder awareness, a sympathy for beasts, whatever belief in an immanent vital force, the Lord of Creation, whatever secret harboring of the idea of human oneness, whatever wishfulness and simplehearted hope, whatever of too much and not enough, all at once and little by little, whatever burning urge to escape responsibility and routine, escape his own overspecialization, the circumscribed and inward-spiraling self, whatever remnants of his boyish longing to fly, his dreams of strange spaces and eerie heights, his fantasies of happy death, whatever indolent and sybaritic leanings, lotus-eater, smoker of grasses and herbs, blue-eyed gazer into space -- all these are satisfied, all collected and massed in that living body, the sight he sees from the window. The Earth, then, becomes a repository and collector of events, desires, and other examples of human existence. But more importantly, such things are described as moments. Does the identification of moments qualify as a historical view? Yes, in the sense that the astronauts are not only experiencing an accumulation of events, but also in that they are performing an act of interpretation. They observe and record the war occurring below, their end result being an identification and collection of human moments. They are also training their own their own interpretative powers on the terrain below. The astronauts acknowledge how the surface of the Earth becomes the repository of all these human moments. The terrain below therefore becomes the site of interpretation and analysis. The idea of moment, taken from the title of DeLillo’s story, provides some interpretative leverage. We are accustomed of thinking of a moment in temporal terms. A moment can be an event, an occurrence of brief duration. Yet “moment” also has a scientific definition. In physics, then, we use the term “moment” to describe rotational force. A moment is therefore a measure of the force produced by an object at a distance. This is an interesting take on the definition not only because it complicates the title of DeLillo’s short story, but also because it describes the act of narration occurring in the story. The narrators impart their own views (and lasers) onto the surface below—it is then quite possible that the “human moments” talked about in the story are a measure of the force acted upon the surface of the Earth by the astronauts aboard the military spacecraft. But “moment” also suggests circular motion. The moment could very well then describe the force of the orbit around the Earth. Periods. Cycles. Such words describe the passage of time. They are concepts with visual analogs—the circular shapes and logics of orbits, rotations, et cetera. They are constructions in the sense that they demonstrate the assigning of words to natural concepts. Thus historian of science Peter Galison identifies two types of constructions, each a specific discontinuity coded to specific type of practice: “To the historian, the choice of periodization (discontinuity in time) roughly parallels the cartographer’s choice of map type (discontinuity in space).” But is there a way to construct continuity, a way to undo these discontinuities implicit in periodization and cartography, but using these very same processes to arrive at a slightly different understanding of landscape? To put it another way, perhaps it is a process not unsimilar to reassembling the age-old unities of time, action, and place as iterated in Aristotle’s Poetics. Contemporary discourses in the field of landscape often mention the process of “recovering” landscape. This process of recovery usually invokes the restorative potential of criticism and history—a way of reclaiming time and space. In his introduction to Recovering Landscape (1999), James Corner considers this project of reclamation as the recovery of “memories, places, sites, ecologies, and potential futures.” Here, my purpose is not to frame the above-mentioned continuity in terms of restoring time and space. Rather, the goal is to use some of the above concepts—periods, orbits, cycles, rockets, and spacecraft—to attempt a different understanding of the landscape below. 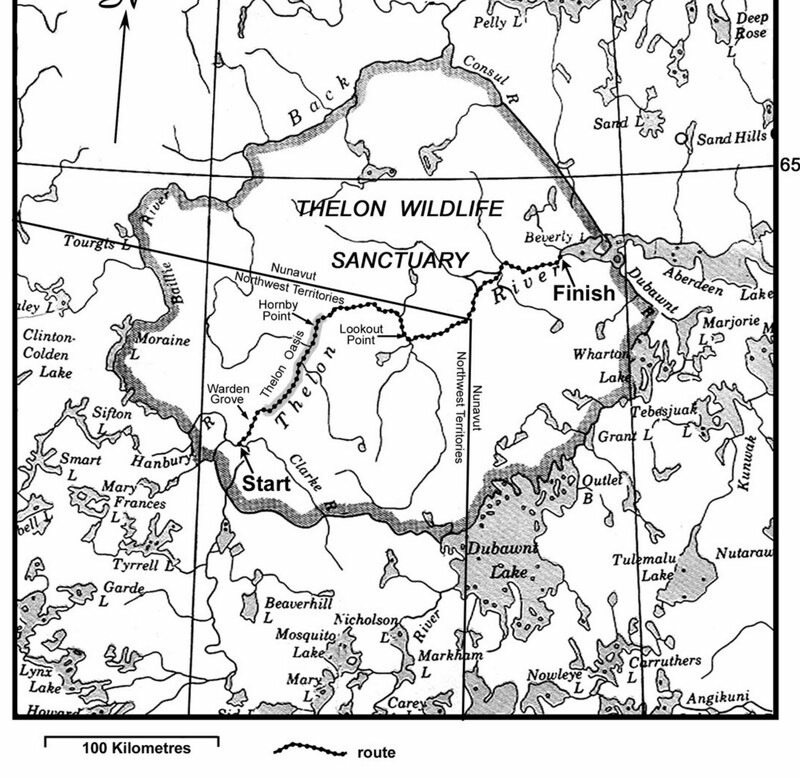 The Thelon River Sanctuary is just that, a refuge in a hard and inhospitable land. A shallow river valley snakes through its tundra and permafrost, the only part of this frozen expanse straddling the border between the Northwest Territories and Nunavut that is not covered by a network of lakes from a previous ice age. These lakes are almost too numerous to mention, but they nevertheless bear a host of unusual names, vestiges of a time when adventurers, explorers, and cartographers sought to document this part of the world. The Thelon River begins as a singular stream collecting water from the Artillery, Moraine, Mary Frances, and Beaverhill Lakes, as well as a small bundling of capillary-like streams—the Hanbury and Clarke Rivers. During Spring and Summer, the colors of the Earth and the permafrost bleed together, creating a uniform dark green mottle that stretches into a semblance of infinity. The only sense of what lies beyond comes from the river itself. During these months of extended daylight hours, the time of the fabled Midnight Sun, the Thelon’s still waters record a mirror image of the stars wheeling their short course around the north pole. Polaris is a permanent fixture, as Ursa Minor’s handle spins around in the sky above like a glowing propeller. The winter landscape is a completely different terrain. The Thelon River is one of the coldest regions in the world. Average temperatures in the Fall and Winter are colder than in the North Pole. There is still great beauty in these months that are less hospitable to human habitation. The Thelon’s low valley becomes a gleaming expanse of the most brilliant snow. These accumulating layers and layers of pure white only accentuate the flatness of this part of the world. Occasional clumps of threadbare evergreen and tundraed berms break up the monotony of this near-perfect isotropic space. A keen-eyed hunter, nerves on edge as the temperature plunges somewhere south of impossible, will notice a fluttering in the distance. And before the idea of a snowstorm even enters his mind, this fluttering ascends into the air: a flock of white-decked ptarmigans begins its southern migration—a phantom fleet navigating unseen airways in the blue expanse above in search of warmer climates. For centuries, Chipewyan and Inuit hunters traveled the frozen terrains—some of the most sparsely unpopulated in North America—tracking herds for food. Each animal has a distinct feature enabling it to be tracked. Moose, for example, are found near trees, telltale clumps of berry pits and seed husks become a sign of where one of these larger, ungainly creatures has just been. Wild herds of musk cover great expanses of snow in a short time, and yet their pungent odor almost always gives away their location. And on a day with very little wind, one of these hunters may well hear a distinct clicking sound off in the distance—a sign of a nearby herd of Caribou, the otherworldly noise being made by tendons rubbing against foot bones. An aerial photograph reveals Warden’s Grove, a small grouping of hills and evergreens on the banks of the Thelon, as the very picture of serenity. Everything is splayed out against an ever-expanding field of white. Snow-capped evergreens point upwards in impossible angles, all gathered together on a gently sloping hill. Patches of fresh snow appear in between the trees. And in some places, the patches seem larger than others. Here, in these exposed areas, a series of cabins become visible. A thick layer of fresh snow covers their roofs, and now it is impossible to determine the actual size of these cabins. Fresh snowmobile tracks provide the first glimpses at the scale of the image. A snowy dugway carves through the powder, connecting the right edge of the picture with the left, bisecting the image between one area, completely covered with trees, and another teeming with signs of human habitations. A larger cabin sits towards the bottom of the picture. A chimney stovepipe breaks through the snow-capped roof, mimicking the directionality of the field of trees in the distance. Two parka-ed men are seen towards the bottom of the photograph, walking on a road-like patch of snow. While the other walks towards the right of the photograph, the other one is caught mid-gesture as he waves at the very person taking this image. This photograph was most likely taken sometime in late September 1978 from the port window of a Canadian Air Force helicopter. 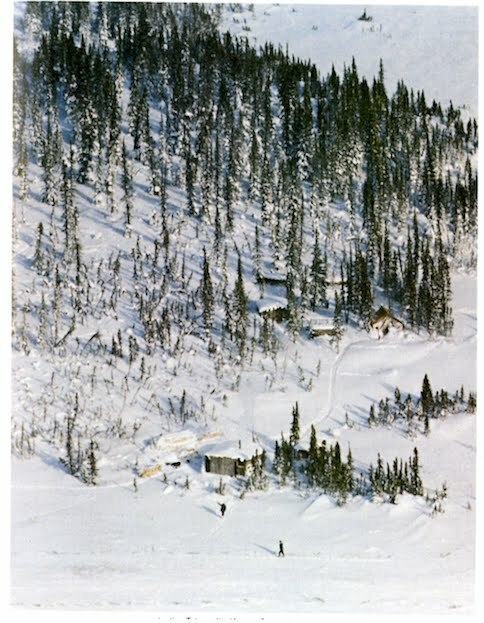 The image depicts Warden’s Grove at the very moment that a group of Canadian and American outdoorsmen was living in the cabins. There is no exact date to the photograph, but it is known that at that time, the skies above the Thelon River Sanctuary would have been buzzing with American and Canadian aircraft. The photograph was included in a United States Department of Energy publication called Operation Morning Light: Northwest Territories, Canada, 1978: A Non-Technical Summary of U.S. Participation. Though its preface indicates that the name was chosen at random by a computer, the name is nevertheless appropriate. On the morning of September 24, 1978, residents of Yellowknife, on the shores of Great Slave Lake, would have seen a white, blazing object in the twilight, spewing fiery bits in its wake. The origin and downward trajectory of this object, as well as the group of American and Canadian campers in Warden’s Grove on the banks of the Thelon are part of the same story. So is a series of events that happened 100 km northeast of Warden’s Grove in the winter of 1926-27. 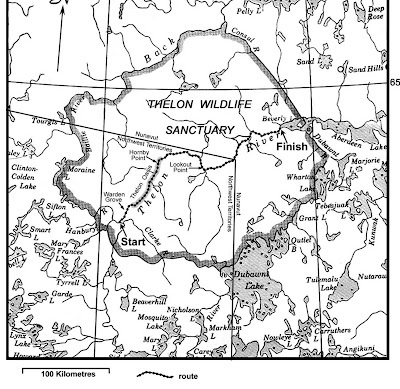 The common denominator to all is the landscape of the Thelon River Sanctuary. How, then, to understand what happened here both in 1927 and in 1978? Understanding these events means more than just iterating the sequence of occurrences that happened here. The landscape becomes a vital component in this understanding. Yet before any discussion about these events and the landscape upon which they occurred can be undertaken, the trajectory of this analysis must bend sideways. This detour focuses on an object that will have an unusual significance for this study of the Thelon River Sanctuary: the V2 rocket. “V2” is the popular name for the Nazi Aggregat 4 or Vergeltungswaffe (retaliatory weapon), the rocket that scientists Wernher von Braun and Walter Dornberger developed in 1942. The V2 was the first rocket capable of carrying a warhead, and its technological innovations would inspire future missile and manned spaceflight programs in the United States and the Soviet Union. The V2 was the first self-powered weapon with a completely ballistic function: it used rocket power to exit the low Earth atmosphere and reentered to hit its target under the force of its own gravity. The Wehrmacht launched over 3,000 V2 rockets from various sites in Northern Europe, hitting targets in England, the Netherlands, France, and Belgium. Though the rocket caused a smaller number of casualties when compared to the destruction from other conventional weapons, the V2 still inspired fear in major metropolitan areas in Western Europe from 1944 until 1945. The V2 was also the inspiration for Thomas Pynchon’s Gravity’s Rainbow (1973), a novel whose main plot lines concern (among many other things) the search for the mysterious guidance system behind a new variant of the V2 called the Schwarzgerät (Black Apparatus), or Rocket 00000. Yet the cinematic nature of Pynchon’s novel has a real-life analogue. 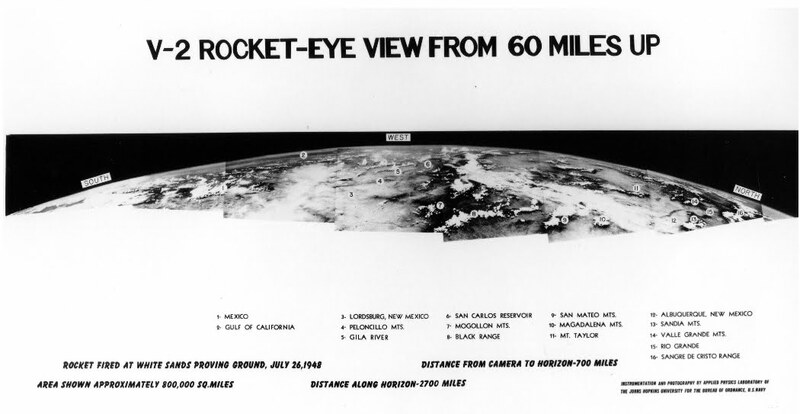 On October 24, 1946, a captured V2 rocket containing a motion picture camera in the nose launched from the White Sands Proving Ground in New Mexico, providing the first-ever film footage shot from outer space. 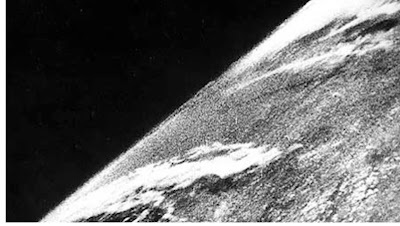 The film, lasting only a couple of minutes, shows the first half of the rocket’s trajectory. A flat expanse of New Mexico desert gives way to a gently curving horizon separating the dark bands of the stratosphere. There is even a sense of increased velocity as the rocket goes higher and higher. The curvatures on the Earth become more pronounced, and there here footage captures something close to escape velocity. And before the footage ends with its final flickers, the smooth trajectory ends. The rocket, the image seems to spiral out of control as the Earth below whirls into an uncontrollable spin. Here is the apogee. Here is the final moment before the second half of the voyage – the downward descent – commences. Far to the east, down in the pink sky, something has just sparked, very brightly. A new star, nothing less noticeable. He leans on the parapet to watch. The brilliant point has already become a short vertical white line. It must be somewhere over the North Sea … at least that far … icefields below and a cold smear of sun. The directionality of such an arrow also finds other applications expressing space-time relations. For example, the principle of entropy conceives of a thermodynamic arrow following in the direction of the expanding universe as available energy decreases. The directionality of time is something we experience, so much so that it almost becomes a truism. Natural life is the nourishing soil of the soul. Anyone who fails to go along with life remains suspended, stiff and rigid in midair. [...] From the middle of life onward, only he remains vitally alive who is ready to die with life. For in the secret hour of life's midday the parabola is reversed, death is born. The second half of life does not signify ascent, unfolding, increase, exuberance, but death, since the end is its goal. The negation of life's fulfillment is synonymous with the refusal to accept its ending. Both mean not wanting to live, and not wanting to live is identical with not wanting to die. Waxing and waning make one curve. This idea of existing beyond death not only echoes the name of the novel’s first section (“Beyond the Zero”), but also considers the end point of the parabola not as an end point, but rather as a transformative moment. Although both of these views of parabolas are thought provoking, they also imply historical and temporal points of view different from Eddington’s. And it is the idea of a parabola as a historical model that becomes important here. In other words, what kind of work is being done by proposing a parabolic view of history? Or, tuning this analysis more to the present needs at hand—the series of events occurring at the Thelon River Sanctuary in 1926-27 and 1978—what is the efficacy of a parabolic model for writing a history of this landscape? Following the call of Bruno Latour, who quipped famously how “There is nothing you can dominate as easily as a flat surface,” histories of models have privileged the complex surfaces of 3-D objects over the flatness of 2-D representations. This is a curious statement, especially when considering that a parabola is a slice through a conical solid. There is much to be learned in this, for although we hardly consider a Cartesian grid as anything other than a flat, isotropic space, a parabola is, in a sense, a representation of a 3-D object. This representative quality is only one way to think about the parabola as a robust device. On the one hand, a parabola is a metaphorical device that can be used to plot out a sequence of events along two axes. On the other, a parabola can operate as a type of historical method. Gravity’s Rainbow uses a parabolic structure to drive the narrative. The novel begins in 1944-45, with the launching and detonation of a V2 rocket in London, and ends in the present day (1972 – the date of the novel’s publication), with a rocket crashing into the Orpheum theatre in Los Angeles. Although it is comprised of four sections, it is the third section—“In The Zone”—that creates the novel’s own center of gravity. Yet it is also the novel’s apogee—the moment where it is the farthest away from conventional ideas of narrative and history. Here, for example, we are introduced to the cinematic and phantasmagoric goings-on of the Zone. The landscape here is nightmarish, otherworldly. The cast of characters is lurid, comic, and absurd. For example, Slothrop takes on his alterego—Rocketman—in search for the mysterious Rocket 00000. Dressed up with the discarded cone of a V2 atop his head, he encounters, among other things, a group Argentinean revolutionaries aboard a requisitioned submarine, American celebrities (such as Mickey Rooney), and even a group of South-West African rocket technicians, the Schwarzkommando, working for the SS. [T]here is no more History, no time-travelling capsule to find your way back to, only the lateness and the absence that fill a great railway shed after the capital has been evacuated, and the goat-god’s city cousins wait for you at the edges of the light, playing the tunes they always played, but more audible now, because everything else has gone away or fallen silent … barn-swallow souls, fashioned of brown twilight, rise towards the white ceilings … they are unique to the Zone, they answer to the new Uncertainty. Ghosts used to be either likenesses of the dead or wraiths of the living. But here in the Zone categories have been blurred badly. In the Zone, then, people, events from different time periods are compressed. The Zone is a site that demands a unique analysis. are bound by time and space, but history as a discipline isn’t. Precisely because of their detachment from and elevation above the landscape of the past, historians are able to manipulate time and space in ways they could never manage as normal people. They can compress these dimensions, expand them, compare them, measure them, even transcend them, almost as poets, playwrights, novelists, and film-makers do. Other than his use of the word “landscape”, this quote is nevertheless interesting as it suggests how time and space can be collapsed, especially in the writing of history. It also invokes the same parameters of altitude and distance that introduced this post. When considering issues of landscape, especially when considering landscape as a site—the very physical terrain where a historical event has taken place—Gaddis’ quote seems like a truism. Recall how W.J.T. Mitchell believes in landscape as a medium of representation. It is true that a landscape is, in some senses, a medium of expression. But the use of word “medium” interests us as it suggests that the landscape is a physical terrain that can be acted upon. Gaddis would thus look at it as a site of historical interpretation. Put another way, a landscape is the place where histories have occurred. On the impossibly cold morning of August 8, 1929, Sergeant C. Trundle, an Inspector for the Great Slave Lake Region of the Royal Canadian Mounted Police, reported a grisly scene inside a rundown cabin on the banks of the Thelon River in the Northwest Territories. Trundle's affidavit describes the discovery of the skeletal remains of three explorers, all Englishmen. One skeleton was that of John Hornby, whose unpublished manuscript, In The Land of Feast and Famine by J. Hornby, or a Life in the Arctic Region, was found alongside his body. Hornby was a seasoned explorer who frequented the Thelon area. Wanting to attract attention to the unspoiled natural beauty of the Thelon River, Hornby embarked on another expedition in early 1926, hoping to prove that he could live in the desolate, wilderness of the area subsisting only on Caribou meat and whatever other game he could procure. Many northerners though Hornby insane—he lived in a cabin on Great Bear Lake for years, and even spent a winter living in a hole in the ground somewhere in Crystal Island in Artillery Lake, north of Great Slave Lake. Yet Hornby was a supremely confident individual—so much so that for this Thelon River expedition, he only brought a sack of flour and some tea for provisions. A note by Hornby found in a tin can near Campbell Lake in 1928 is somewhat optimistic. Dated August 5, 1926, the note reads: “Owing to bad weather, I lay West, traveling slowly. One big migration of Caribou passed. Expect to see you soon.” The three explorers, however, settled too far north of the Caribou migration, isolating themselves from their expected source of sustenance. 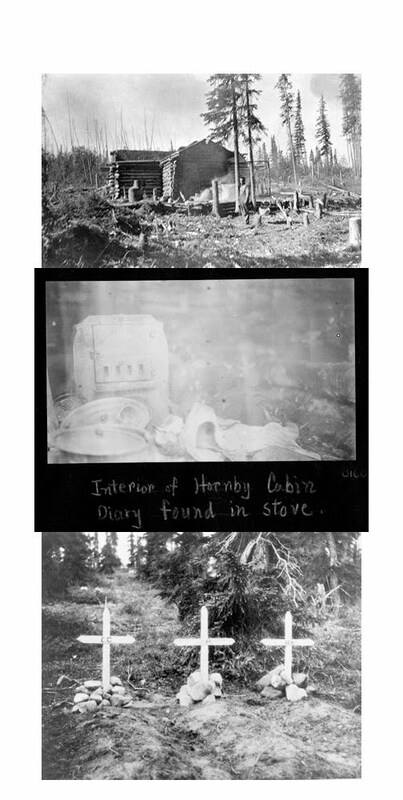 Hornby starved to death on April 14, 1927. Next to Hornby's corpse, Sergeant Trundle found the body of Harold Adlard, who died only a couple of weeks later, on May 4 1927. The third set of remains belonged to Edgar Christian, John Hornby’s 18-year old nephew and amateur explorer. Make preparations now. Got out, too weak and all in now. Left things late. Christian began writing these daily entries in October 1926, before he embarked on the trek with Hornby and Adlard. And less than a year after the beginning of his expedition, his body buckling due to malnutrition, Christian’s clipped, pithy style is matter-of-fact, as if he were protecting future readers from the grisly details of starvation. Because death was a lonely and personal business, the young explorer wanted only to present a bare minimum of details. Christian depicts the barren, frozen steppes of the upper Northwest Territories, where gale-force winds and winter temperatures averaging somewhere south of -20 degrees Fahrenheit made exploration a hazardous business indeed. The Thelon River area that Hornby, Adlard, and Christian explored in 1926 and 1927 was then terra incognita. Hornby made regular visits to the area, and his growing love for the fecund yet bare Thelon area no doubt inspired Adlard and Christian to go along on this last, deadly jaunt. One morning, almost 50 years later, a group of American and Canadian campers were pitching tents at Warden's Grove, near the Thelon River. Newspaper accounts tell us that Gary Anderson, 30, of Rock Island, Ill.; Chris Norment, 26, of Las Vegas; Kurt Mitchell, 28, of Jackson, Wyo. ; John Mordhorst, 28, also of Rock Island; Michael Mobley, 26, of Mesa, Ariz., and Robert Common, 33, of St. Anne de Bellevue, Canada were keen outdoorsmen, sharing John Hornby's love for the Thelon wilderness, and recreating the explorer's last, and most famous expedition. On the morning of January 24, 1978, one of these men noticed a white blazing object streaking across the sky, spewing fiery bits in its wake. Mobley and Mordhorst ventured to the impact site, and on the way, noticed smoldering pieces of metal wreckage. What were these pieces, and how did they get there? Late in 1977, a rocket took off from Launch Complex LC90/19 at the Baikonur Cosmodrome in Kazahkstan. The rocket was a Tsiklon-3 Intercontinental Ballistic Missile (ICBM), the largest booster system ever built by the Soviet Space Agency and Air Force. The Tsiklon-series rockets were also the feared “city busters” that spurred a massive surge in ballistic missile research in the United States during the 1960s and 70s. 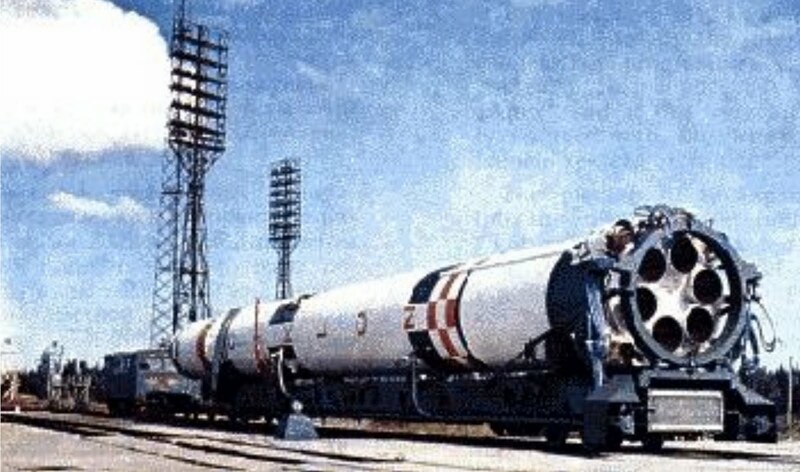 Although the Soviet military built 308 silos housing Tsiklon missiles, at Baikonur, the missiles were used for deploying a large array of military satellites. 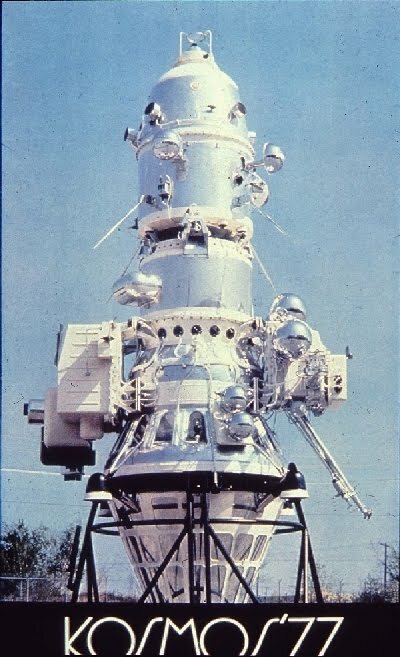 Tsiklon rockets were the preferred delivery for the Soviet US-A marine reconnaissance program, known to US intelligence as the Radar Ocean Reconnaissance Satellite system, or RORSAT. RORSAT satellites were generally cylindrical-shaped affairs, with two large radar arrays on each side, enabling ground controllers to see objects on the Pacific and Atlantic Oceans in all types of weather conditions. RORSAT satellites also featured the latest in Soviet nuclear reactor technology: a Romashka-type reactor carrying a Uranium-235 core to power all electrical and navigational systems aboard the satellite. 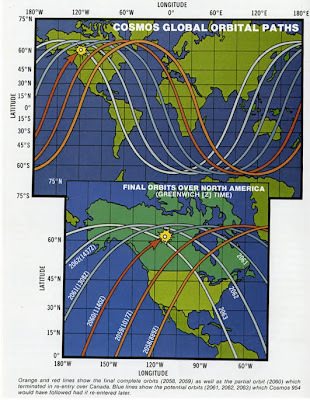 After a RORSAT satellite completed its mission (sometimes lasting years), the radioactive powerplant would be ejected to a higher, safer orbit away from other satellite traffic. 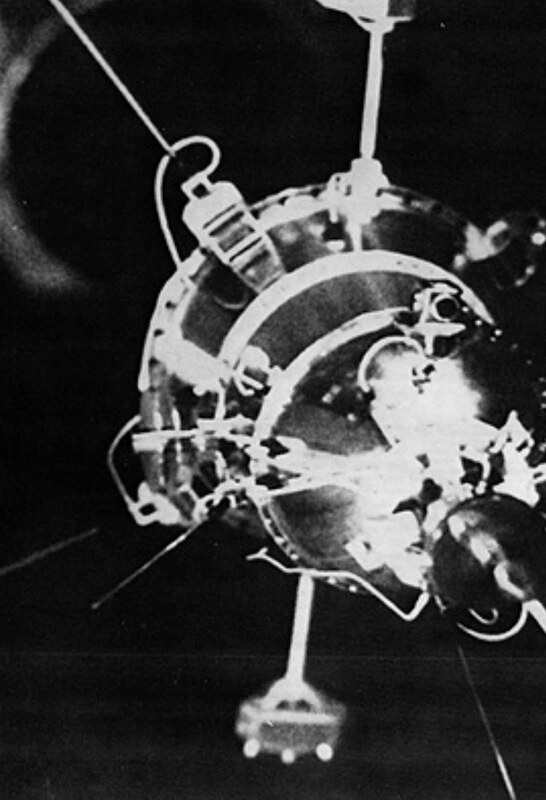 The first RORSAT, COSMOS 102, was launched on December 27, 1965 and featured chemical batteries. The first nuclear powered RORSAT, COSMOS 469, was launched on Christmas Day 1971. 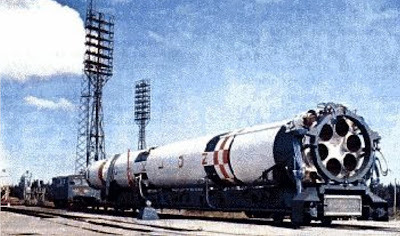 On September 18, 1977, a Tsilkon-3 rocket carrying the latest RORSAT, COSMOS 954, launched from Baikonur Cosmodrome. COSMOS 954 was designed to monitor naval activity—specifically, the movement of large surface vessels—in the Pacific and Indian Oceans through a series of intersecting orbits: during the first orbit, the radar equipment would be trained towards the Pacific, and during the second, the orbit would be adjusted so that the equipment could scan the Indian Ocean with little adjustment to the equipment. 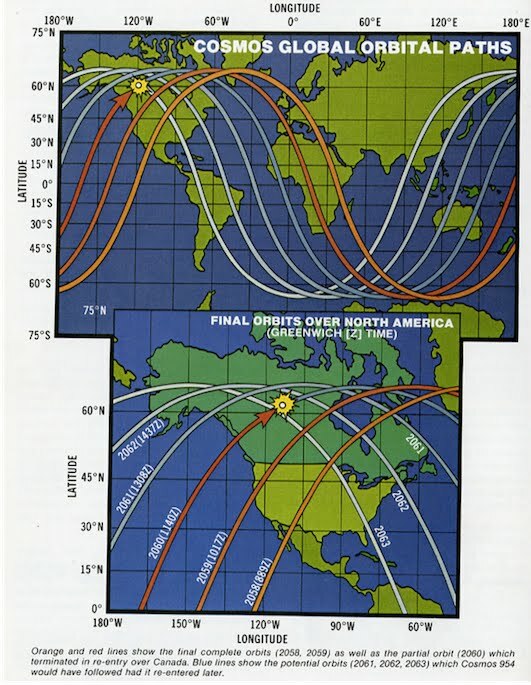 In January 1978, reports began to surface that COSMOS 954's orbit was beginning to decay. And to make matters worse, the Soviet Space Agency was unable to jettison the satellite's reactor core due to a mechanical malfunction. This activity was, of course, closely monitored by North American Aerospace Defense Command facilities in Colorado and Alaska. After a brief diplomatic spat between the U.S. and Soviet governments, it had been generally accepted that COSMOS 954 would reenter the Earth's atmosphere with its reactor core aboard. A working group of scientists from the US and Canadian governments was formed to prepare for the accidental release of radioactive material in the atmosphere. On January 19, 1978, the Soviet government informed US officials that though the reactor core would not melt down, that it could nevertheless disintegrate upon reentry. The result would be an unprecedented type of nuclear disaster—an airborne, upper-atmospheric release of radioactive debris. There was even speculation that the satellite would crash in India. But it wasn't until January 24th that anyone had any inclination as to where COSMOS 954 would crash. Early that morning, after completing its 2,060th revolution around the earth, at 6:53 a.m. EST, COSMOS 954 entered the Earth’s atmosphere somewhere over the Queen Charlotte Islands (north of Vancouver), and tumbled in a northeastern direction across Great Slave Lake, Fort Resolution, Yellowknife, Fort Reliance, and finally towards Baker Lake. U.S. and Canadian armed forces responded with a massive (and highly technical) cleanup effort. Dubbed OPERATION MORNING LIGHT, the cleanup effort not only involved the on-site recovery of radioactive debris, but also utilized spectrometer-equipped Royal Canadian Air Force transport aircraft as well as high-altitude atmospheric sampling missions by U.S. Air Force U2 spyplanes. The clean up effort ended in April 1978. By that time, crews assigned to OPERATION MORNING LIGHT surveyed over 124,000 square kilometers and logged over 4500 hours of flying time, all in search for pieces of the doomed COSMOS 954. In the end, it was determined that most of Romashka reactor and its contents burned up in the atmosphere, and that the pieces strewn along the hoarfrost posed very little danger. The most radiologically intense piece, about the size of a nickel, was found on February 23 and appropriately sent to the Whiteshell Nuclear Research Establishment in Pinawa, Manitoba. Yet OPERATION MORNING LIGHT scientists also determined some radioactive material became airborne during the event: some 80,000 sq. km. of land east of the impact site, near Hay River, received a light dusting of radioactive material. Here, I want to go back to that date, January 24, 1978, when the second Thelon River expedition saw COSMOS 954 entering in the morning sky, leaving flaming debris in its wake. 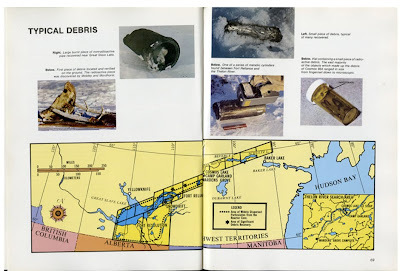 Recall that Michael Mobley and John Mordhorst went to find the satellite’s impact site—a recreation of Hornby’s, Adlard’s, and Christian’s search for Caribou around the Slave Lakes region. Both of these narratives—the ill-fated Hornby expedition and the crash of COSMOS 954—both come to an end in the same general location. 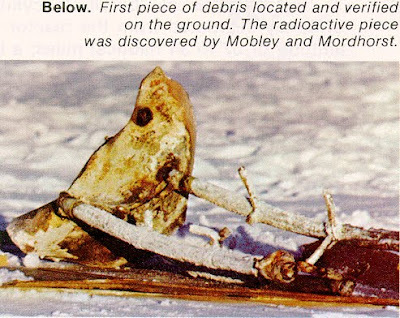 The very first piece of wreckage found by the American and Canadian campers in 1978, with two bent metal rods splaying out in opposite directions, even looked like a pair of Caribou antlers that John Hornby would have loved to see in the deadly winter of 1926-1927. Even local newspaper accounts described this piece of wreckage as "antlers." Both the Hornby expedition and the fall of COSMOS 954 are narratives told from a fairly conventional point of view. The preferred methods of chronicling the events specific to each are familiar. Thus Edgar Christian uses a diary in order to give a day-by-day account of the fated Hornby expedition. John Hornby was also working on an account of his travels before he became too ill to write. It is worth mentioning that when Funk and Wagnall’s published Christian’s diary in 1938 (with the awkward title Unflinching), its editors only added a biographical commentary at the beginning of the volume. 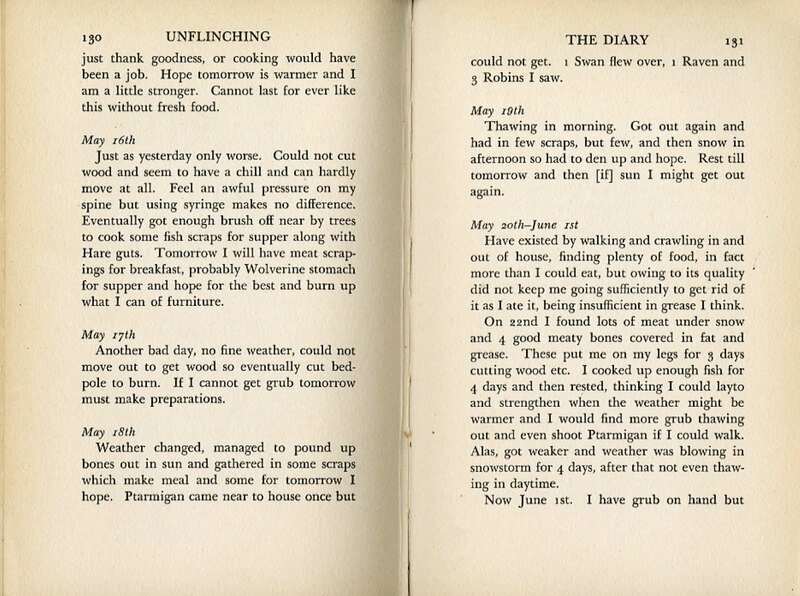 The diary entries were left untouched. Grammatical and spelling errors remained a testament to the young explorer’s ordeal in the Thelon River area. 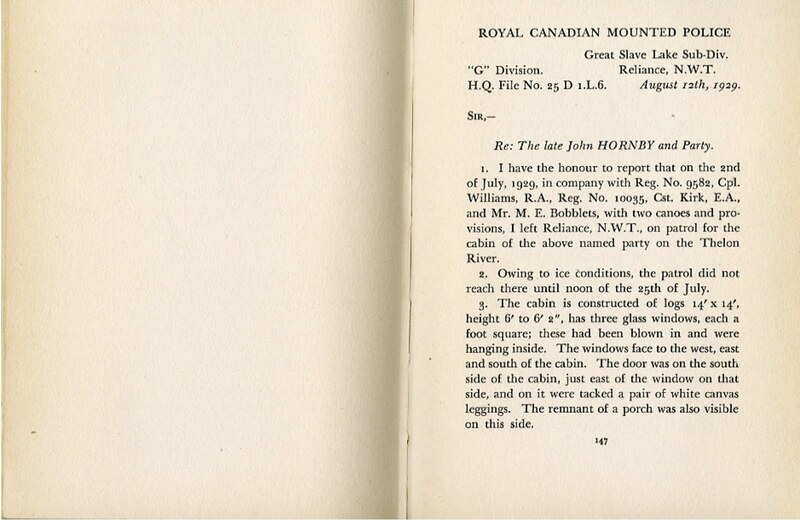 An appendix to Unflinching includes Sergeant Trundle’s report as well as other material by the RCMP related to the Hornby expedition. These devices are also familiar in that serve to document the finds. Here, for example, one will find Trundle’s description of the landscape surrounding Hornby’s cabin, as well as the condition of the bodies. They also serve a temporal function in that they give the times that Christian’s, Adlard’s and Hornby’s bodies were discovered, as well as the minutiae related to the filing of the reports and other materials. Legal materials, such as these, fascinate for their ability to generate their own paper trails. Through proceedings, hearings, trials, appeals, the process of lawmaking is not only one that involves many actors, but it is also a process that is very aware of its own production. For example, legal precedents are often agglomerated under the term res judicata—an idea suggesting that previous laws, et cetera, have solidified and become something more than just papers. As Wernher von Braun would have suggested, law has transformed into something else, something omnipresent, looming, and all-too-existent. 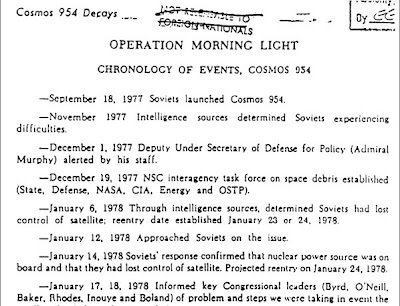 The documents related to the fall of COSMOS 954 and OPERATION MORNING LIGHT use familiar conventions. 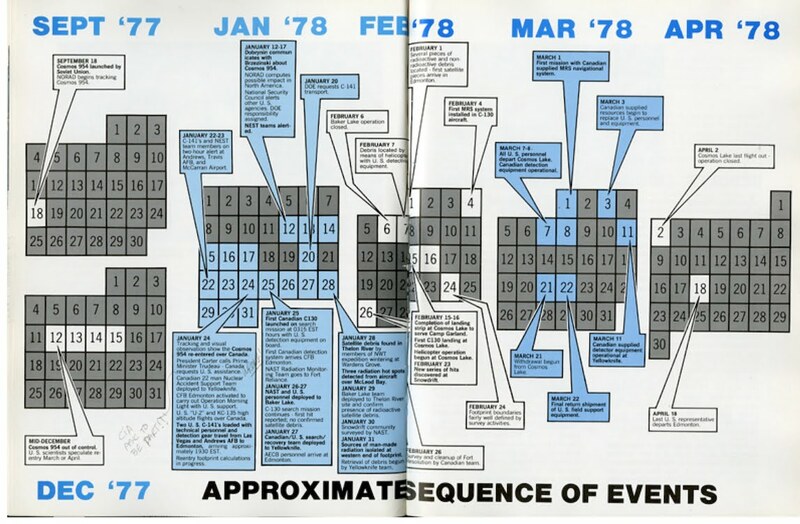 On the one hand, the official Department of Energy publication features a series of calendars giving a day-by-day account of the events relating to the incident as well as to the subsequent clean up. A series of arrows point to specific days of the week—the actual spaces on the calendars are enlarged to give a sense of how these days are different from others. 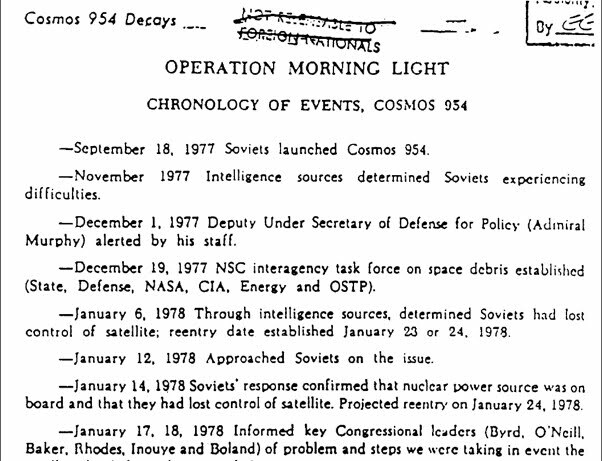 And on the other hand, Gus Weiss’s report from 1978 detailing the intergovernmental relations and impasses ends with a very rote listing of dates related to OPERATION MORNING LIGHT. 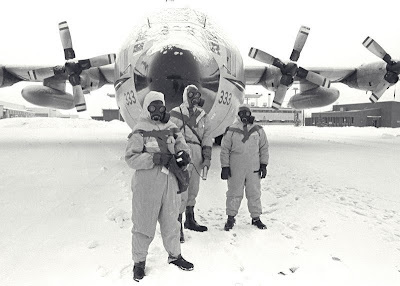 Called a “Chronology of Events”, this list begins with September 18, 1977 (“Soviets launched Cosmos 954”) and ends with January 24, 1978 (“AFTAC/MAC aircraft and Nuclear Energy Search Teams dispatched to Canada”). 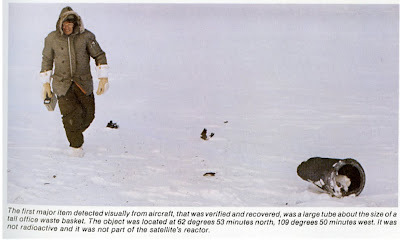 Both texts circumscribe the events dealing with the fall of COSMOS 954 in different ways: whereas the Department of Energy publication ends with the final moments of the cleanup effort, Weiss’ document begins with the cleanup effort. Because he was writing a document whose primary concerns included intelligence matters as well as U.S.-Soviet relations, the details of the cleanup were superfluous. One of the most recognizable terms concerning the probative value of evidence is “paper trail.” The term has literal and figurative connotations. Whereas a trail of material gives the investigator, detective, or magistrate physical proof that something has occurred, it is the idea of a trail of materials that becomes just as powerful. Yet both readings of this term can be collapsed onto each other, so much so that it is the image of materials strewn in some kind of order across a landscape that really captures our imagination here. In other words, the paper trail is a powerful idea because it signals some type of agency. Whether or not someone decided to leave materials for others to discover, the point is that some type of action or event occurred that created this trail. Another literary analogue may elucidate the matter: though Theseus “read” the Cretan labyrinth by following the thread through walls and spaces, Ariadne’s creation of the trail with a ball of twine was an interpretive act. Re: The late John Hornby and Company. 1. I have the honour to report that on the 2nd of July, 1929, in company with Reg. No. 9582, Cpl. Williams, R.A., Reg. No. 10035, Cst. Kirk, E.A. and Mr. M.E. Bobblets, with two canoes and provisions, I left Reliance N.W.T., on patrol for the cabin of the above named party on the Thelon River. The following items in the list, starting with the number two, provide exact descriptions of all the materials found in Hornby’s cabin. Starting with a physical description of the cabin, Trundle’s report becomes a catalog of artifacts related to the business of wilderness survival. Paragraphs and sections describe the contents of suitcases, the condition of clothing, the amount of cordwood left by the stove, ruined photographic equipment, rusted firearms, and even unused medicines. It is these, and the discovery a “test tube … ingeniously converted into an appliance suitable to administer an enema” that give Trundle and the rest of the RCMP inspectors an idea as to how Christian, Adlard, and Hornby died. They verified everything with the contents of Christian’s diary. A similar emphasis on the materiality of found objects is central to the Department of Energy’s report on OPERATION MORNING LIGHT. According to the report, a helicopter crew found the very first piece of debris on February 1, 1978 – a “large tube about the size of a tall office waste basket” that was not radioactive. The sizes of materials found afterwards vary in size. 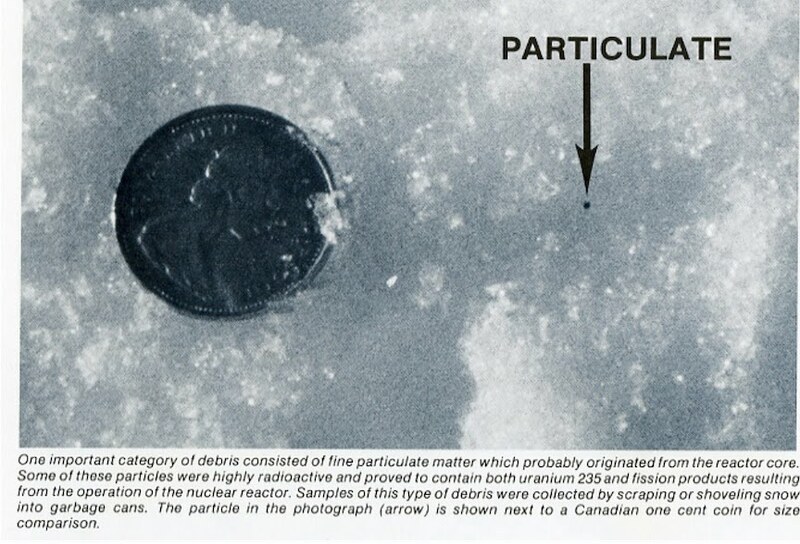 Thus tiny pieces of particulate matter, shown alongside a Canadian one-cent coin for size comparison, were found around the shores of Great Slave Lake. Due to the amount of emitted radiation, scientists determined that these particles contained both Uranium 235 and other fission materials created by operation of the reactor aboard COSMOS 954. 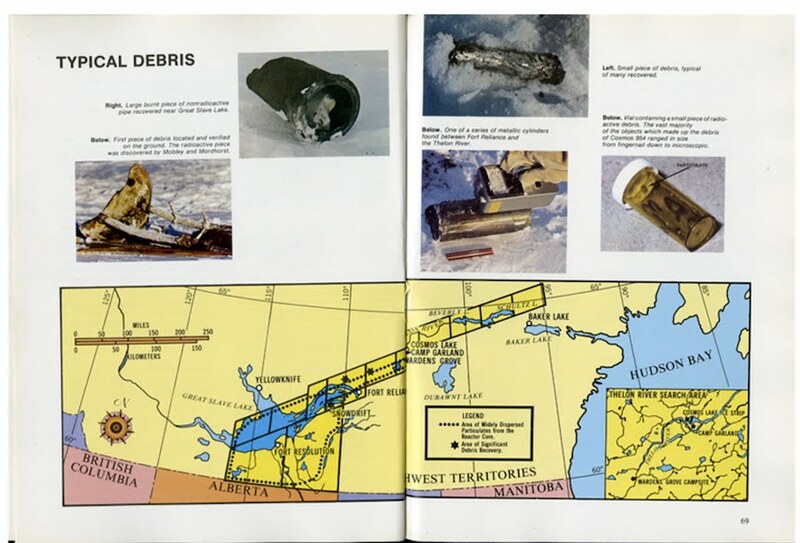 In another section of the report—entitled “Typical Debris”—pictures of cylinders, burnt pieces of metal, Mobley and Mordhorst’s “antlers”, as well as other particulates give the reader a sense of the variety of objects found after the satellite crash. 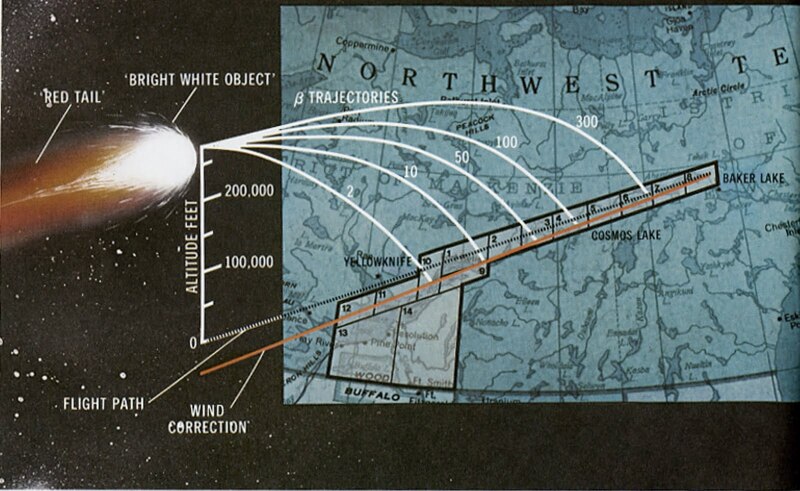 At the bottom of this section, a map of Northern Canada shows COSMOS 954’s final descent into Canadian airspace in relation to the location of found particles—an image of a trail of debris. Two additional images, earlier in the report, give a more three-dimensional explanation, showing how “massive objects with a high mass to drag ratio” tended to fall further than other objects. This emphasis on the miniscule and material finds an interesting analog within the pages of Gravity’s Rainbow. In a darkened, candlelit room, somewhere near the Mittelwerke rocket facility in Central Germany, scientists and regents from the IG Farben chemical company (IGF) attend a séance. The Second World War was only a year old, and on this occasion, IGF scientists, along with members of the SS, look to a spirit medium to prophesize the outcome of the current conflict. The medium unexpectedly channels the ghost of Walter Rathenau, the founder of the German public utility, the Allgemeine Elektrizitätsgesellschaft, or A.E.G. The appearance of this ghost is particularly creepy not only because Rathenau was brutally murdered by right-wing thugs in 1922, but also because he implores the IGF/SS elite that the future (or demise) of the Third Reich lies in chemical molecules. “[Y]ou must look into the technology of these matters,” Rathenau implores, “Even into the hearts of certain molecules—it is they after all which dictate temperatures, pressures, rates of flow, costs, profits, the shapes of towers.” As the novel indicates, the nature of these molecules is inextricably linked to the control of the industrial and political processes that allow these chemicals to be made in the first place—an indication of a true synthesis of power and science. The fall of COSMOS 954 involved a similar confluence of science and global power relations. Weiss’ document shows how in the days leading to COSMOS 954’s reentry, American and Soviet officials engaged in a diplomatic pas de deux in which they exchanged a protracted series of communiqués in order to ascertain the faulty satellite’s condition. But like Ginzburg’s own views on Morelli, Holmes, and Freud, Pynchon’s statement emphasizes how the identification and collection of material, miniscule evidence becomes a type of historical method in itself. It is a method apt for the collection of debris on the Thelon River Sanctuary in the early Fall of 1978. Pynchon’s description of the launch of Rocket 00000 at the end of Gravity’s Rainbow is telling: “This ascent will be betrayed to Gravity”, he writes. The sentence is suggestive and prefigures, among other things, the eventual descent of Rocket 00000. The term “Gravity” not only alludes to the gravitational forces that will influence the trajectory and first half of the Schwarzgerät’s parabola, but also prefigures something ominous and death-like that will cause a descent. This idea of a descent also has other similar connotations. The placement of the sentence near the very end of Gravity’s Rainbow is an acknowledgement of the novel’s own denouement. A type of entropy is therefore reached, a dwindling of energy that mirrors the rocket’s own downward motion. Something similar to this process of winding down appears in Edgar Christian’s diary of the Hornby expedition. In his conclusion to Unflinching, B. Dew Roberts reads the intent in Christian’s very last diary entry, suggesting how “his last ounce of strength is devoted to setting that house of death in order, that whoever came after might read and understand.” According to this reading, then, Christian is the one who, nearing the end of his journey, arranges all the material artifacts to ensure that someone can later construct the series of events that led to this end. 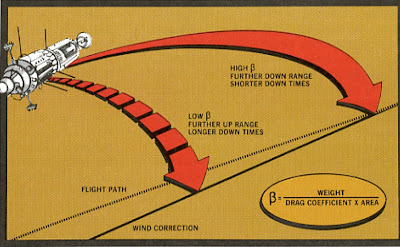 The Department of Energy Report concerning OPERATION MORNING LIGHT also uses images and diagrams to help readers understand the significance of COSMOS 954’s final descent. At the very beginning of the document, two mercator projections illustrate COSMOS 954’s orbital paths with a series of numbered, colored weaves. Both show “partial orbit 2060”—the satellite’s last revolution, its entry into Canadian airspace marked by a star-like shape. The images discussed in the preceding section showing the relationship between the mass of COSMOS 954’s pieces and the location of their impact use downward arcs and curved arrows to suggest the last moment of a parabolic voyage. Two histories collapse upon a landscape. 50 years separate these two series of events, yet both occur on the same site—the banks of the Thelon River, close to the Slave Lakes in the Northwest Territories of Canada. Both involve the search for a common object—Caribou—albeit in unusual ways. This post has tackled the two disparate storylines of the Hornby expedition and of the fall of COSMOS 954, and demonstrated how they share a common landscape. Yet how do we read these histories in the landscape? This post has taken an unusual approach in its attempt to articulate a different reading of landscape. The object of inquiry—the Thelon River Sanctuary—provides a unique opportunity to test out a parabolic history. It is important to note that although the term "parabolic" has mathematical connotations, it is the structure of Gravity's Rainbow that guides the use of the term for the purposes of this post. Gravity’s Rainbow is a known in the fields of architecture and landscape design. Pynchon himself makes ready connections between science and the built environment. In a novel as strange and sprawling as Gravity’s Rainbow, for example, connections between August Kekulé’s chemical architectures and the production of Imipolex G for the Schwarzgerät’s guidance systems is near tacit. And yet Pynchon exploits such connections to even greater effect when describing Nazi architect Etzel Ösch’s “double integral” plan of the Mittelwerke, the production facility for V2 rockets. The trend continues. Sanford Kwinter makes the connection between Kekulé’s former training as an architect and contributions to organic chemistry, making a case for the idea that the histories of modern architecture and 20th century science follow similar trajectories. His observation that the Benzene molecule is a type of architectural plan seems forced, if not based on a basic formal similarity between Kekulé’s molecule and the plan of Mies’ glass skyscraper (1922). Yet this post has sought a different track with the application of Gravity’s Rainbow to the facts at hand. There are two chief motivations for the application of the novel’s parabolic structures to the Hornby expedition and the fall of COSMOS 954. On the one hand, the parabolic structure became a useful method for applying two series of events occurring at different times, but sharing an object in common. 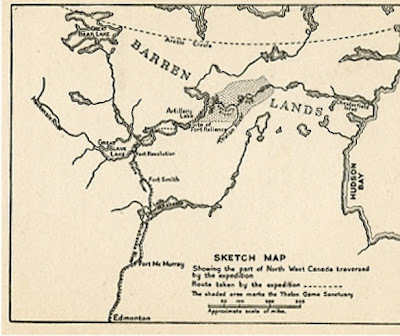 The objects common to the Hornby expedition and the fall of COSMOS 954 are Caribou and the Thelon River landscape. On the other hand, it is the latter of these—the vast permafrost plains of the Thelon River Sanctuary—that really commands the application of the various parabolas in Gravity’s Rainbow. This study will hopefully demonstrate how Pynchon’s novel can suggest a different way of reading historical events into the physical terrain. L.P. Hartley, The Go-Between (New York: NYRB, 2002 ), p. 17. Peter Galison, Image and Logic: A Material Culture of Microphysics (Chicago: University of Chicago Press, 1997), p. 10. James Corner, “Recovering Landscape as a Critical Cultural Practice” in Recovering Landscape: Essays in Contemporary Landscape Architecture (New York: Princeton Architectural Press, 1997), p. 18. United States Department of Energy, Operation Morning Light, Canadian Northwest Territories/1978: A Non-Technical Summary of U.S. 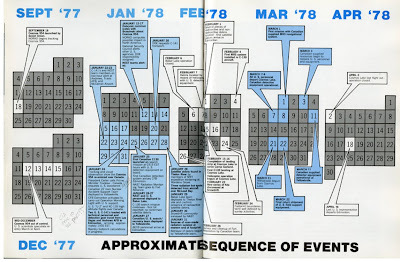 Participation, Document NV-198 (Las Vegas, Nevada: U.S. Department of Energy, Nevada Operations Office, 1978) p. iii. Thomas Pynchon, Gravity’s Rainbow (New York: Penguin, 1995 ), p. 6. Lance W. Ozier, “The Calculus of Transformation: More Mathematical Imagery in Gravity’s Rainbow”, Twentieth Century Literature, Vol. 21, No. 2, Essays on Thomas Pynchon (May, 1975), p. 201. Arthur Eddington, The Nature of the Physical World (New York: Macmillan, 1929), p. 69. C.G. Jung, “The Soul and Death”, in The Collected Works of C.G. Jung: The Structure and Dynamics of the Psyche, Hebert Read, ed. (London: Routledge, 1960), pp. 405-408. Bruno Latour, “Drawing Things Together”, in Michael Lynch and Steve Woolgar, eds. Representation in Scientific Practice (Cambridge, Massachusetts: MIT Press, 1990), p. 45, quoted in Nick Hopwood and Soraya de Chadrevian, “Dimensions in Modeling”, in Models: The Third Dimension of Science (Stanford, California: Stanford University Press, 2004), p. 2. “Dimensions in Modeling,” p. 2. There are those, however, who do not see the parabolic drive in Gravity’s Rainbow. See, for example, Paul A. Bové, “History and Fiction: The Narrative Voices of Pynchon’s Gravity’s Rainbow”, Modern Fiction Studies Vol. 50, No. 3 (2004), pp. 657-680. John Lewis Gaddis, The Landscape of History: How Historians Map the Past (New York: Oxford University Press, 2002), p. 17. W.J.T. Mitchell, “Imperial Landscape”, in Landscape and Power (Chicago, Illinois: University of Chicago Press, 2002 ), p. 30. C. Trundle, “Re: The Late John Hornby and Party” in Edgar Christian, Unflinching: A Diary of Tragic Adventure (New York: Funk & Wagnalls, 1938), p. 154. All facts related to the investigation, unless otherwise noted, come from Christian’s diary. Prince of Wales Northern Heritage Centre, Historical Timeline of the Northwest Territories (Accessed 18 April 2009). Gus W. Weiss, “The Life and Death of Cosmos 954” (1978). Beatriz Colomina, “Introduction: On Architecture, Production and Reproduction” in Architectureproduction (New York: Princeton Architectural Press, 1988), p. 7. Carlo Ginzburg, “Clues: Roots of a Scientific Paradigm”, Theory and Society Vol. 7, No. 3 (May, 1979), p. 280. Ginzburg, “Morelli, Freud, and Sherlock Holmes: Clues and Scientific Method”, History Workshop No. 9 (Spring, 1980), p. 13. Marc Bloch, The Historian’s Craft (Manchester, United Kingdom: Manchester University Press, 1992 ), p. 46. 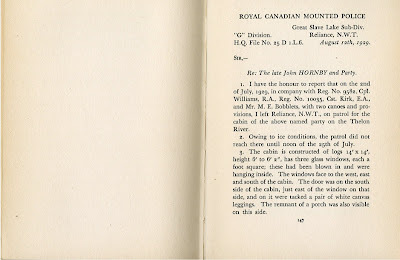 Trundle, "Report of the Hornby Expedition", H.Q. File No. 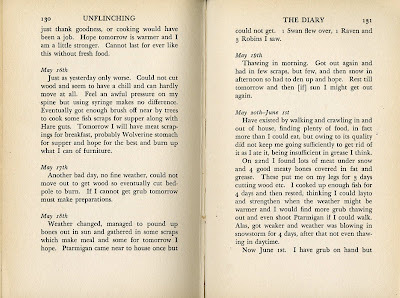 25, D 1.L.6, in Edgar Christian, Unflinching: A Diary of Tragic Adventure (New York: Funk & Wagnalls, 1938), p. 147. United States Department of Energy, Operation Morning Light, Canadian Northwest Territories/1978: A Non-Technical Summary of U.S. Participation, Document NV-198 (Las Vegas, Nevada: U.S. Department of Energy, Nevada Operations Office, 1978) p. 19. John Milton, The Reason of Church-government Urg’d against PRELATY (1641), available at (accessed May 3, 2009). Sanford Kwinter, “Mies and Movement: Military Logistics and Molecular Regimes”, in Detlef Mertins, ed. The Presence of Mies (New York: Princeton Architectural Press, 1994), p.89. Very interesting. However, in referring to the Dene people of the area,in "From the Air," they are Chipewyan, not Chippewa. Duly noted! Thank you for the correction, and thank you for reading! I already corrected the text. very nice read. i really enjoyed the structure, and i want to go back and reread again looking at it more closely, but had some preliminary comments... i really enjoyed your use of the paraboloid, and how the two narratives come together in the landscape [as the axis], while ever diminishing, into the minutia of data, and finally into shards, remains, litter, etc. that is left on both sides. at least that was my take of it. i did like the initial use of momentum, but i thought you didn't need it--it is nice but is maybe too much? you have such a strong move with the parabola, and complicate it with gravity's rainbow [apparently a big hole in my education and in my reading list for this summer], that the momentum part i felt got lost. i don't know, maybe i didn't get the connection? i'll read again later. i'm wondering if you've talked about this with spyros and ed, because last year i heard both of them use parabolas as narrative accessories in very different ways [completely different from what you're doing]. overall enjoyed reading very much! Thanks for stopping by! Indeed, this post is driven more by structure and coincidence than by anything else ... so when you say that you get a little lost in the discussion on momentum, I must admit that I do as well. It's by no means a perfect piece of writing. As a matter of fact, it's an edited version of a paper I wrote about a year-and-a-half ago. Obviously, I need to revisit it in order to clear up any of its conceptual ambiguities. I have not seen neither Ed's nor Spyros' take on parabolas. Although I am assuming that Ed's is about the Siege of Paris, and Spyros' is on Semper's "Ueber die bleiernen Schleudergeschosse der Alten und über zweckmässige". As for Pynchon, I feel as if I rely on his books more than on others'. "Gravity's Rainbow" is my "Theory and Design in the First Machine Age." There is a lot of the story that you have not told, like the parts of Hay River, Fort Smith, Pine Point and Fort Resolution all in the NWT that are effected by this, still to date...there is too many of us in the north that are sick and dieing from this Cosmos 954 of January 24, 1978.